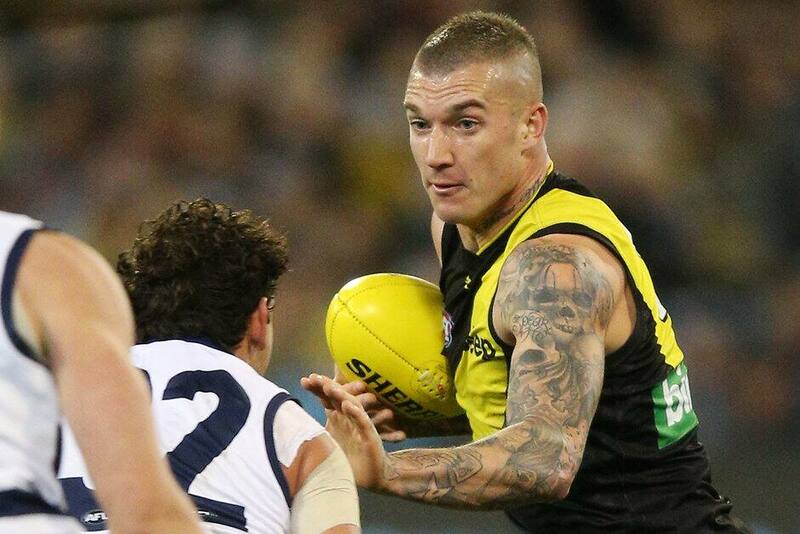 IF YOU are struggling to picture a moment where Richmond superstar Dustin Martin was tackled by a Geelong player on Friday night, then you would not be wrong. The gun midfielder was not letting anyone stand in his way as he delivered yet another best-on-ground performance, carrying the finals-starved club into its first preliminary final since 2001. The manner in which he asserted himself on the contest was notable, with the Brownlow Medal favourite recording six broken tackles – the equal second-most of his career – against Geelong. Martin and Port Adelaide speedster Jarman Impey hold the AFL record for broken tackles with seven. Friday night was the fourth time the Tiger has had six broken tackles in a game - an AFL record - and follows the six broken tackles he notched against St Kilda in round 23. Martin finished with 28 disposals (14 contested), nine inside 50s, four goal assists and 12 score involvements, thriving in the second half as the rampant Tigers ran away with a 51-point win. Martin's much-vaunted 'don't argue' came into play a number of times on Friday night, with Cats Scott Selwood, Sam Menegola, Tom Stewart, Mitch Duncan and Brandan Parfitt all feeling the star Tiger's brute force. When Martin brushed off a Stewart tackle on the outer wing of the MCG to set up a Dion Prestia goal, which put the Tigers up by 13 points at three-quarter time, he started the ball rolling for Richmond's rampant last-quarter run. Martin's amazing ability to bust through pressure or make the opposition miss sticking a tackle was epitomised by the AFL-leading 68 broken tackles he recorded across the home and away season. Such was Martin's dominance, that figure was 44 more than the next best player – Port Adelaide's Sam Powell-Pepper (24). On the other hand, Geelong has prided itself on its ability to stick its tackles this season and headed into Friday night's clash as the No.1 team in the AFL for effective tackles (70.5 per cent). However, the Cats were well down on their usual output and failed to live up to their own reputation, allowing a season-high 13 broken tackles against the Tigers. Although seemingly nothing went right for Geelong on what was a dirty night, sticking its tackles is one thing Chris Scott's team can instantly fix for Friday night's do-or-die semi-final against Sydney. Laying body pressure on the opposition and locking the ball into the contest against a battle-hardened team like Sydney will be crucial to the result. It could be the difference between Geelong falling to another meek loss and making a game of it against the in-form Swans.